Preheat oven to 350. Combine 1/2 c sugar and 1/2 c softened butter in large mixer bowl, beat at medium speed until creamy (2-3 minutes). Add 3 T maple syrup* and continue beating until well-mixed. On low speed add 1-1/2 c flour and 1/4 t salt. Shape dough into 1" balls and place on cookie sheet 2-3" apart, flatten with bottom of tumbler or with small toddler's (clean!) hands. Bake for 12-14 minutes. *the original recipe I based this on called for maple-flavored pancake syrup, so you'll be fine using that I'm sure! Incredibly easy to make. I scooped the dough with my cookie scoop and put the blobs of dough on a sheet, then helped Emily flatten each one with her hands (note the finger marks!) before baking. I think I baked them a minute too long -- watch them closely! They did not burn or get too dark, but they were on the crisp side. Preheat oven to 350. Combine 1/2 c butter and 1 c (light!) brown sugar in saucepan, stir over medium heat until butter melts. Add 2 c rolled oats, 1/4 t salt and 1 t baking powder, mix well and pour into a greased 8"x8" pan. Bake for 20-25 minutes, let cool and then cut into squares. These are weird. For one thing, I have dark brown sugar, and I'm thinking from the photo in the book that they mean for you to use light brown sugar. Evan and I ate them all, but the whole time we were going "do we like these? I'm not sure!". 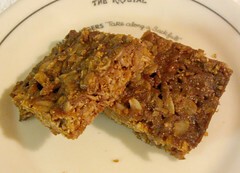 Very much like a very good granola bar -- which gives me some idea how much sugar must be in a granola bar!! I might try them again with light brown sugar just to see how they turn out, but I don't think they'll be making regular appearances in the cookie jar here. Not that we actually have a cookie jar, but....you know what I mean. But the maple cookies will definitely be coming back soon! The Maple Sugar Cookies look yummy. I'm vegan, so I'm always on the hunt for good egg-less cookies. If you don't have an egg on hand you can always substitute a 1/2 banana for recipes that would do alright with a little banana-y flavor. Wow, I've never heard that tip -- substituting banana for eggs? I'll keep that in mind, with a toddler in the house there's almost always bananas hanging around! I ran into the same situation as you, my Daughter was looking so forward to making cookies today and when I returned home we found we didn't have any eggs. 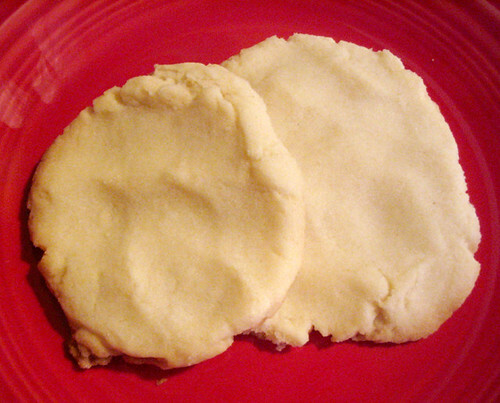 It is so hard to find eggless cookie recipes on the internet and some how by the grace of God during this Christmas week I ran into your recipe. She loves maple syrup so this recipe was amazing! We also found an easy recipe for frosting and decorated them with sprinkles also. I highly recommend this recipe and thank you so much for sharing it! Merry Christmas!! andrea - I just saw this comment and I'm so glad you guys liked this recipe! We have to make it practically weekly around here. Good thing it makes such a small batch!